The Alpha Centauri Star System is a stellar system composed of three stars; Alpha Centauri A, Alpha Centauri B, and Proxima Centauri. 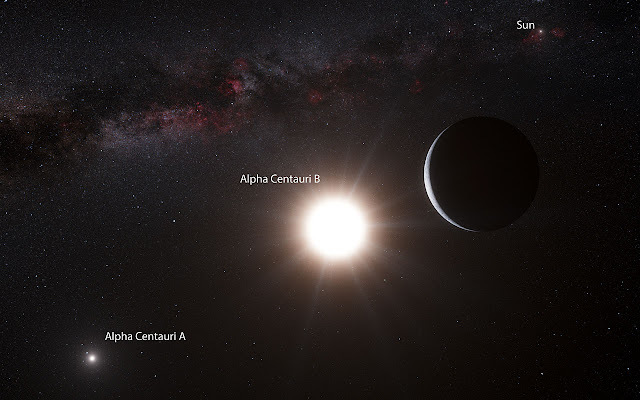 Being only 4.3 light years away from our Solar System, the Alpha Centauri star system is the closest star system to us. Of the three stars, Proxima Centauri is the closest to the Earth. Using the High Accuracy Radial velocity Planet Searcher (HARPS) spectrograph at La Silla Observatory in Chile, astronomers have discovered an exoplanet that is about the same mass of the earth orbiting Alpha Centauri B. “Our observations extended over more than four years using the HARPS instrument and have revealed a tiny, but real, signal from a planet orbiting Alpha Centauri B every 3.2 days,” says Xavier Dumusque (Geneva Observatory, Switzerland and Centro de Astrofisica da Universidade do Porto, Portugal), lead author of the paper. “It’s an extraordinary discovery and it has pushed our technique to the limit!”. The results will appear online in the journal Nature on 17 October 2012. HARPS is a a high-precision echelle spectrograph attached to the 3.6m telescope of the European Southern Observatory (ESO). A spectrograph is an instrument that separates an incoming wave into a frequency spectrum. The planet was detected by picking up very tiny wobbles caused by its gravitational pull to the motion of Alpha Centauri B. These wobbles are very tiny and comparable to that of a baby crawling; no more than 51 centimeters per second. Alpha Centauri B is slightly smaller and less bright compared to the Sun. The newly discovered planet revolves around it six million kilometers away, closer than the distance of Mercury to the Sun. Because of this, the planet is not habitable being too hot for life to flourish. Although this is the first planet with a mass similar to the Earth, its close orbit around Alpha Centauri B takes it out of the habitable zone conducive for Earth's life. This discovery though gives hope to scientists who are optimistic that they are close to discovering a perfect planet that can sustain life similar to the Earth. “This result represents a major step towards the detection of a twin Earth in the immediate vicinity of the Sun. We live in exciting times!” concludes Xavier Dumusque.